WM candidates outperform the national average once again! Leading HR training and qualifications provider Watson Martin has much to celebrate following the latest Advance Diploma exam results published by the CIPD in July. For WM candidates have outperformed students from other CIPD centres with 80% gaining a pass or higher in their May 2018 Advanced level exams compared to 75% nationally! The performance of our Leading, Managing and Developing People (LMP) candidates was particularly impressive with 89% achieving success. Around the country, 83% of candidates passed the LMP exam. Watson Martin candidates also performed well in the challenging Human Resource Management in Context (HRC) exam with 73% being awarded a pass or higher compared to 65.5% nationally. 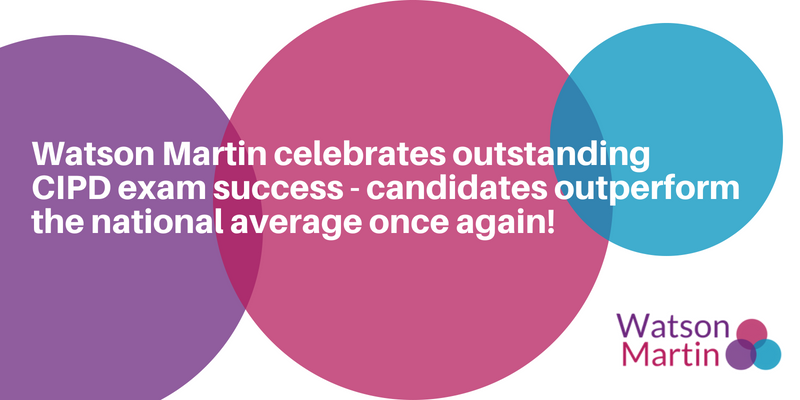 Only eight candidates nationwide achieved the top grade of Distinction in HRC, two of which were awarded to Watson Martin candidates. All candidates who complete the CIPD Advanced Diploma with Watson Martin are able to attend specifically tailored workshops before they sit the exams to help them with the revision process. Evaluation revealed that 99% of students described these workshops as either ‘excellent or good’ with nine out of ten describing the tutor’s knowledge as ‘excellent’. Keep up with the latest news and updates here. Continue the conversation by leaving your comments below. Jo is a senior marketing practitioner with over 25 years’ experience in the workplace learning, corporate skills and human capital industries. Jo has an in-depth understanding of online and offline marketing strategies and has strong business and commercial acumen. What’s the Future for HR? CIPD Sale 2019: Learn more. Spend less.